NOTE: This post originally appeared at Huffington Post’s Latino Voices blog. 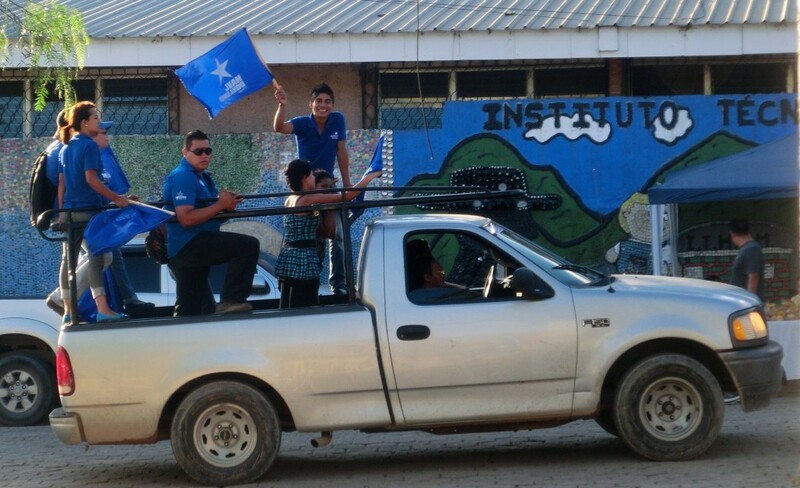 For more of Suffragio‘s coverage and reporting on Honduras, click here. TEGUCIGALPA, Honduras — Erick Martínez remembers exactly where he was when Erick Martínez was killed. 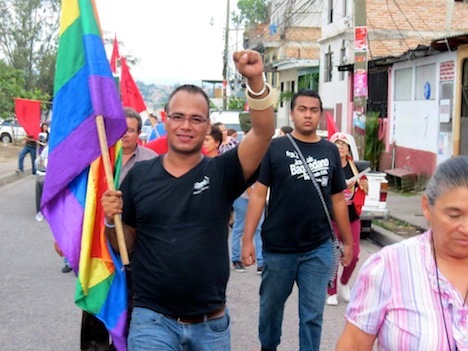 Erick Vidal Martínez, today one of Honduras’s most high-profile LGBT activists, was supposed to meet Erick Martínez Avila at one in the afternoon on an otherwise temperate spring day in May 2012. Martínez Avila had been selected to be the representative of the LGBT community in the congressional primaries for Honduras’s new leftist political party, the Party of Liberty and Refoundation (known by its acronym, LIBRE, which is Spanish for “free”). But the LGBT community had planned to meet on May 6, 2012 to hold a full assembly in order to ensure that all voices, including transsexual and transgender members of the community, could provide input on the campaign ahead. The next day, May 7, was Erick Vidal Martínez’s birthday. When the other Erick didn’t send so much as a text message to mark the occasion, the community’s brief annoyance deflated quickly into concern. Later that day, they learned the news — Erick Martínez Avila had been kidnapped off the streets of Tegucigalpa, the capital city of Honduras. His kidnappers ultimately strangled him to death and discarded his body in a ditch on the outskirts of town. It was among the more high-profile of dozens of assassinations within Honduras’s struggling LGBT community — another top LGBT activist, Walter Tróchez, was shot while walking down the street in December 2009. Erick Vidal Martínez knew both of them well — as friends, as political allies, as part of his support network in a country where dissent of any stripe has become increasingly perilous. No one would have blamed him for packing his bags, filing an asylum application and catching the next flight to Ottawa. Or Brussels. Or London. Instead, just days before Hondurans voted in a landmark general election, Erick met with me for coffee in downtown Tegucigalpa to explain why he’s picked up the fight where the other Erick, Walter and other murdered LGBT activists left off, and why he’s willing to risk his life to fight for greater rights for the diversity community in Honduras, a task that could become ever more treacherous in the years ahead, when Honduras’s new conservative president, Juan Orlando Hernández, will be inaugurated Monday, January 27. Even as Xiomara Castro de Zelaya continues to dispute the victory of center-right rival Juan Orlando Hernández in last month’s presidential election, the Honduran electoral commission released the final results of the parliamentary elections that were also conducted on November 24. As expected, no single party won a majority in the 128-member, unicameral Congreso Nacional (National Congress). 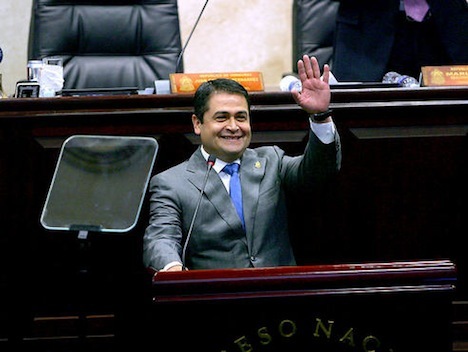 That means when Hernández is inaugurated as Honduras’s next president, he will do so with less power than he had as president of the National Congress over the past four years. With just 48 deputies, his center-right Partido National (PN, National Party) will return to the National Congress not only without a majority, but with 23 fewer seats than in the previous Congress, during which the National Party controlled both the National Congress and the presidency under outgoing president Porfirio Lobo Sosa. Since the return of regular democratic elections in 1981, each of Honduras’s presidents has also held a majority (or near-majority) in the National Congress, so there’s not a lot of precedent for coalition government to which its leaders can now turn. 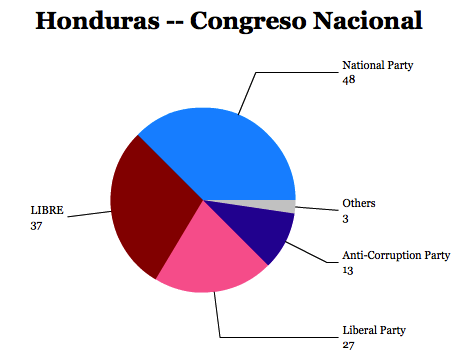 Despite the novelty of coalition politics in Honduras, however, it’s about to become a vital component. Though Castro de Zelaya (and her husband, former president Manuel Zelaya) might be disappointed by her apparent 8% loss to Hernández, they should be buoyed by the success of their party, the Partido Libertad y Refundación (LIBRE, Party of Liberty and Refoundation), in the parliamentary elections. By winning 37 seats in the National Congress, LIBRE has prevented any single party from winning an outright majority, a radical change to modern Honduran politics. 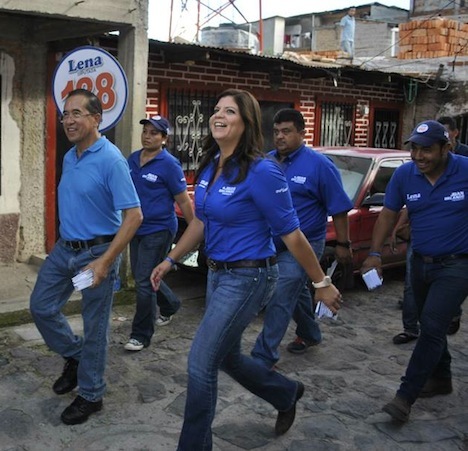 Although Zelaya and other left-wing activists founded LIBRE only in June 2011, taking with them many of Zelaya’s supporters in the traditionally center-left Partido Liberal (PL, Liberal Party), it has now displaced the Liberal Party as the second-strongest force in the National Congress. That leaves the Zelayas with a choice. They can continue a path of resistance against an election that they argue was fraudulent (less in terms of ballot fraud and more in terms of fundamental unfairness in the environment of danger and fear for LIBRE candidates). By doing so, however, the Zelayas risk losing popular support in the same way that Andrés Manuel López Obrador gradually lost steam in his protests against the 2006 Mexican election results, and the Zelayas risk alienating LIBRE from the other main political parties. 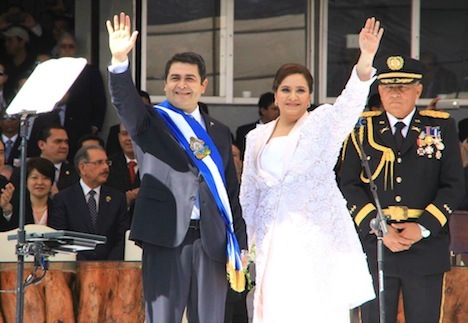 Or they can take up the mantle of Honduras’s chief democratic opposition from their relatively strong perch in the National Congress, where Zelaya (the former president) will now hold a congressional seat. 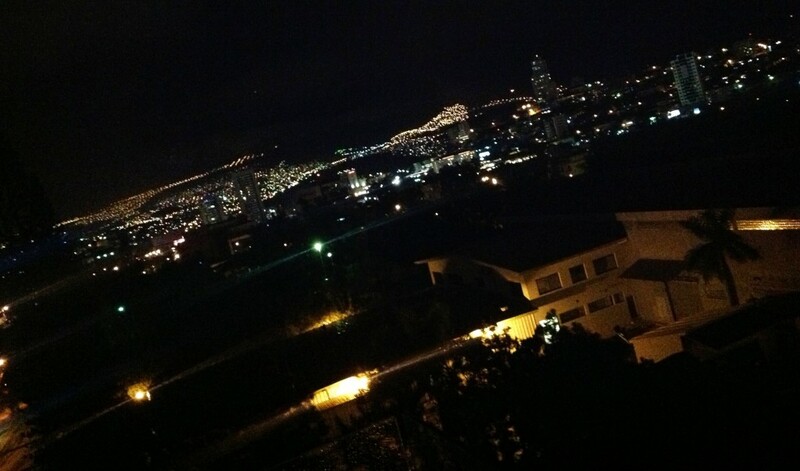 TEGUCIGALPA, Honduras – The June 2009 coup that ousted Manuel ‘Mel’ Zelaya from office was the first 3 a.m. call of U.S. president Barack Obama’s administration. While Obama and Hillary Clinton, then the U.S. secretary of state, condemned the coup and the interim government’s refusal to reinstate Zelaya, the United States returned to business as usual with the election of Porfirio Lobo Sosa later that year, and U.S.-Honduran cooperation, especially militarily, has been on the rise during the Lobo Sosa administration. As Juan Orlando Hernández prepares to assume the Honduran presidency — like Lobo Sosa, he comes from the conservative Partido Nacional (PN, National Party), it also likely means continuity in US policy toward Honduras, specifically, and Central America, generally. Though the votes aren’t even fully counted, and there are real questions about the November 24 election’s fairness, it’s hard to believe that U.S. policymakers are too upset about the apparent defeat of Xiomara Castro de Zelaya, the wife of the former president, and the leader of the newly formed LIBRE, which would have pulled Honduras in a more leftist direction – and toward closer contact with Venezuela, Ecuador and Bolivia, each of whom have challenged U.S. influence in Latin America. There’s another risk that the Obama administration’s Central American policy could be causing more harm than good by ‘feeding the beast’ of corruption among police officers and impunity among drug traffickers, the very things that U.S. aid to Honduras is ostensibly designed to combat. With three more upcoming elections in Central America over the next six months, it’s a particularly relevant opportunity for the Obama administration to review its policy in the region. Guatemala’s conservative president Otto Pérez Molina came to power early last year, promptly declared the ‘war on drugs’ a failure, and issued a powerful call to legalize drug use. Even Felipe Calderón, who militarized the Mexican fight against drug traffickers in the late 2000s, has argued that legalization might be the most effective policy weapon in combatting drug-related violence in Latin America. Even as some libertarian Republicans in the United States increasingly believe that the four-decade ‘war on drugs’ is a failure at home, it’s easy to underestimate the damage that war has wrought in Latin America, with North American demand fueling an illicit drug supply, together with subsequent US-sponsored military efforts throughout the region, that have destabilized entire countries – Colombia in the 1990s, Mexico in the 2000s and Honduras today. Research from Horace Bartilow and Kihong Eom, professors of political science at the University of Kentucky, finds that U.S. drug policies have caused greater levels of drug violence in Latin America. Even when countries are ‘successful’ in their supply-side fights against drug traffickers, demand dictates that the suppliers find new countries, establishing a vicious ‘bubble problem’ – success in one country means that a new chapter opens elsewhere as traffickers search out new bases for drug operations, a tragic game of ‘whack-a-mole’ on a hemispheric level. Today, Honduras’s president-elect Juan Orlando Hernández met with the presidents of three Central American neighbors — Nicaragua, Costa Rica and Panamá (two of whom will be replaced in elections that are scheduled to be held within the next five months). 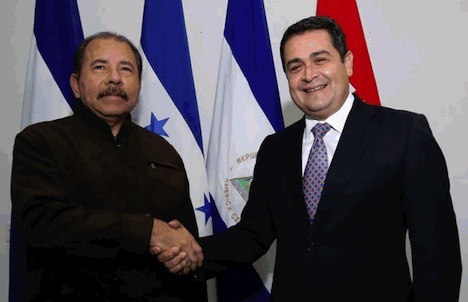 But the photo that most stands out is the one above, with Hernández, the conservative leader of Honduras’s Partido Nacional (National Party) gripping and grinning with Nicaragua’s president Daniel Ortega. Trade between the two countries is increasingly important, and the two counties still have strained relations over a border dispute in 2000-01. 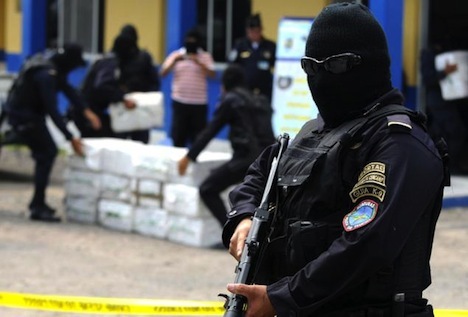 Honduras shares nearly all of its southern border with Nicaragua and, as drug trafficking becomes an increasingly insoluble problem for Honduran security, there are fears that Nicaragua (with a homicide rate that’s equal to just one-fourth of Honduras’s) could destabilize as well. So it’s obviously important for Ortega and Hernández to have a strong working relationship. But Ortega, as the leader of the Frente Sandinista de Liberación Nacional (FSLN, Sandinista Front of National Liberation) is a stridently left-wing president with little respect for democratic institutions. Though he’s transformed from guerrilla-style revolution in the 1980s into more run-of-the-mill corruption today, he remains the most anti-American (pro-Venezuelan) socialist leader in Central America. It’s been just a few days since Hernández was determined to be the winner of Honduras’s November 24 election. That result continues to be challenged, but it seems increasingly likely that Hernández will indeed be Honduras’s next president. 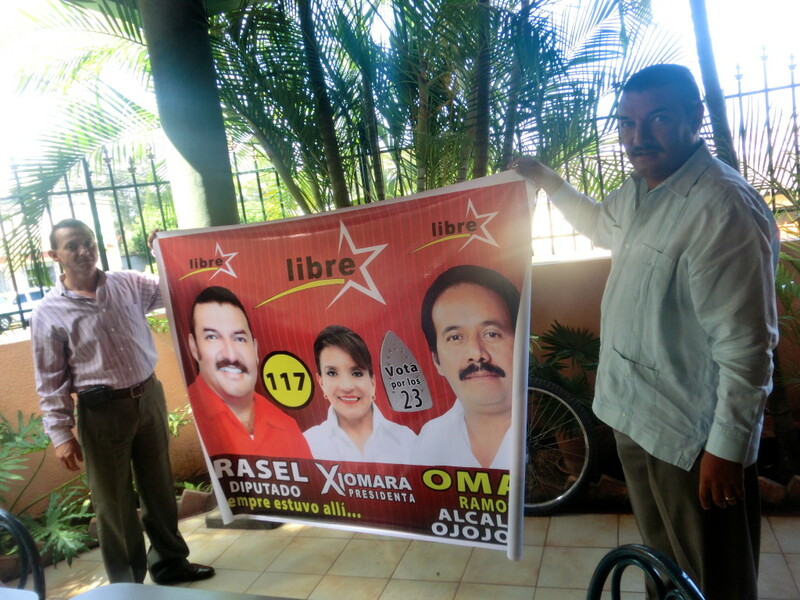 But consider a parallel universe where Xiomara Castro de Zelaya, leading the campaign of the firmly leftist Partido Libertad y Refundación (LIBRE, Party of Liberty and Refoundation), had posed with Ortega days after winning the election. You’d have half of Honduras and much of the US policymaking apparatus up in arms about Honduras’s sudden left turn, and it may well have obscured Castro de Zelaya’s first week as president-elect by causing a domestic or international brouhaha. It’s not a particular commentary on either Castro de Zelaya or on Hernández, but just a point about how critically perception matters in international affairs. What for one candidate is a run-of-the-mill meeting with the leader of a neighboring country would have taken on a much more ominous tone for another candidate. Good morning from Jerusalem, where it’s 5 a.m. Monday morning. 1:17 am — On Facebook, some activity from both Hernández and Villeda. Hernández is thanking Villeda for a telephone call congratulating him for his victory; Villeda is thanking his supporters for two years of support, in what amounts to something of a concession (though Villeda doesn’t actually concede in the post). Hernández now leads with 556,333 votes (34.27%), followed by Castro de Zelaya with 466,537 votes (28.67%), Villeda with 339,919 (20.94%) and Nasralla in fourth with 251,224 (15.47%). Vásquez has fallen back — he’s still in fifth place, but just barely and with hardly any material support with 3,339 votes (0.21%). To recap, however, both Hernández and Castro de Zelaya have declared victory, Nasralla has alleged TSE fraud, and there’s not exactly a lot of public trust in Honduran public institutions, so don’t expect this to end anytime tonight. 12:17 am — The fourth candidate in the race, Villeda, is obviously not declaring victory, but neither is he alleging fraud. In character, he’s cautioning patience on Twitter and awaiting more communications from the TSE. 12:08 am — Nasralla is now calling the vote’s integrity into dispute, arguing that 25% of tallies from the TSE ‘have different totals than when transmitted to parties’ according to Honduras Culture and Politics, per Twitter. Nasralla has now called the results fraudulent — remember that though Nasralla’s the fourth-place candidate, he pulls a lot of support from relatively conservatives voters who might otherwise support Hernández. It seems increasingly likely that this won’t be sorted out tonight, even if the TSE reports more than the 43% of provisional results that it’s already announced. Yesterday, Saturday two leaders of the Libre party were assassinated after leaving a party meeting in the community of Carbón in the municipality of Canta Rana, department of Francisco Morazán. The incident occurred at 8:50 pm. Braulio Almendares, general secretary of the National Agricultural Workers Central PNPP, denounced, on Globo TV, that the leaders were ambushed by two individuals wearing ski masks and heavily armed. The now deceased individuals are the Hondurans Julio Ramón Araujo Maradiaga (67) and María Amparo Pineda Duarte (52), who is a leader of the campesino cooperative group Carbón. “The woman had already received death threats which leads us to believe that the crime had a dual meaning”, said the complainant. 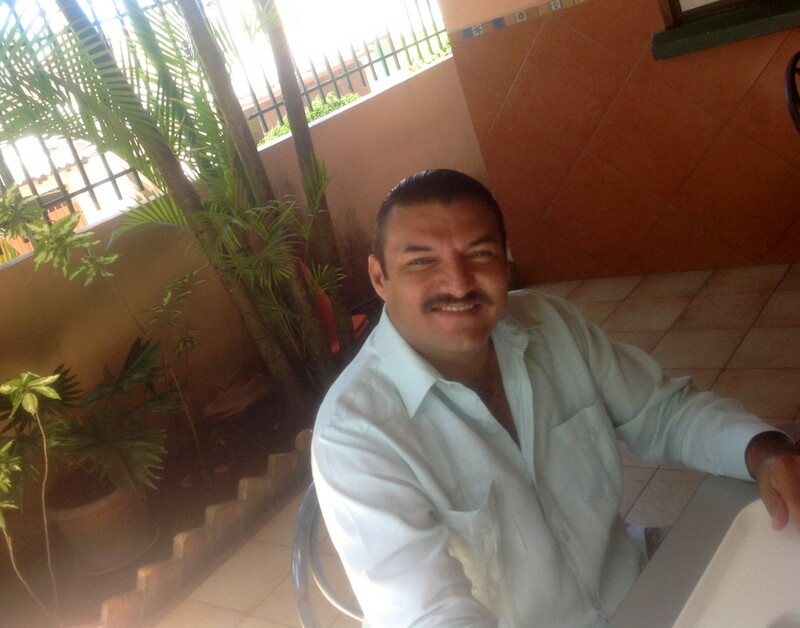 Wilmar Alexander Solórzano, son of María Ampara, assures that she and her family have enemies and that they don’t know where the killing comes from. While it doesn’t mean that Hernández’s lead, if it holds up, is fraudulent, the vast campaign of intimidation against LIBRE and the Honduras left (among others, including journalists) certainly means that an eventual victory for Hernández will always be tainted with unfairness. That’s especially troubling in light of the human rights abuses that have increased with greater impunity since the June 2009 coup. If Hernández does win with a 5% or 6% margin over Castro de Zelaya, it may well be that he could have won the election, even in conditions more openly ‘free and fair’ than the current conditions. 10:59 pm — No word yet on which party will win the National Congress, and by what margin. That’s almost as important as the presidential election. If Hernández does win the election with around 32% or 34% of the vote, he’ll do so with the smallest mandate since the return of regular democratic elections to Honduras since 1981 (though that outcome has been almost a certainty since the summer, if not earlier). There’s no guarantee that the National Party will win a majority in the 128-member congress, especially given the open-list proportional representation system, so Hernández will likely have to find a way to form an alliance. I write for the Miami Herald/McClatchy today about the advent of Honduras’s new policia militar (military police) force, the historical and cultural context of military police in Honduras and the consequences for Honduras in its fight for greater security, for Central America and for US foreign policy in the region. 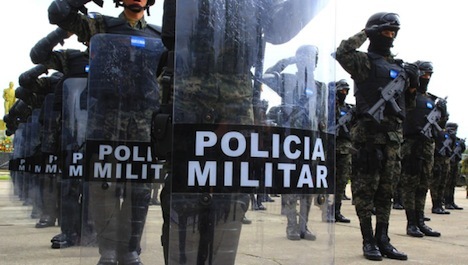 Juan Orlando Hernández, the candidate of the conservative Partido Nacional (PN, National Party) and the president of Honduras’s Congreso Nacional (National Congress), spearheaded the legislative effort to create the military police in August. The first thousand police deployed earlier this autumn, but the force is at the heart of Hernández’s campaign — he promises to put a ‘soldier on every corner’ and that he’ll do ‘whatever it takes’ (¡voy hacer lo que tenga que hacer!) to straighten out Honduras’s violent crime problem. Though Honduras returned to regular democratic elections in 1981, it wasn’t until 1998 that the military came fully under civilian control and a civilian police force began to take shape. Still, civil police are poorly paid, and many Hondurans say they fear the police as much, if not more, as the fearsome street gangs and drug traffickers. Hernandez hasn’t dispelled the notion that protecting human rights and upholding the rule of law is less important to him that battling runaway crime. It was also in 1998 when the much-feared military security force, Fuerza de Seguridad Pública (FUSEP), was dismantled. 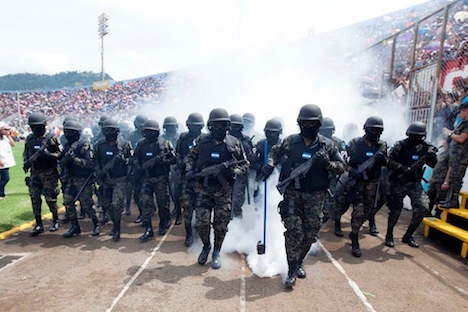 As FUSEP receded, a civil police emerged, but as Honduras became an increasingly choice destination for drug trafficking, corruption increasingly corroded the civilian police force and even the military. But the petty crimes of today’s civil police pale in contrast to FUSEP’s past abuses. In the 1980s, Honduran military forces perpetrated abuses against internal dissenters through the promulgation of ‘death squads’. One of the most notorious was ‘Battalion 316,’ whose members were trained by U.S. Central Intelligence Agency agents, and who targeted government opponents with imprisonment, torture and death. In this case, the past is also uncomfortably close to the present — Billy Joya, a former Battalion 316 member, is running for Congress in Sunday’s election. To place the military police in even greater historical context, it’s important to remember that the National Party of outgoing president Porfirio Lobo Sosa hasn’t shied away from collaboration with the military in the past – the armed forces supported National Party strongman Tiburcio Carías Andino in the 1930s and the 1940s and the more recent regime of Oswaldo López Arellano, who also had links to the National Party, in the 1960s and early 1970s. Against that background, some critics worry that Hernández could attempt to take consolidate power to nearly authoritarian levels. Photo credit to La Prensa. TEGUCIGALPA — Germán Leitzelar seems particularly spry for 68 years. In the course of an hour’s discussion in his law offices on the top floor of the Miraflores mall in central Tegucigalpa, he’ll bound up to grab a well-worn copy of the Honduran constitution to make a point, and then point out one article after another with the tenacity of an attorney half his age. Leitzelar (pictured above) is at once both inside and outside Honduras’s political elite. A congressman for the Partido Innovación y Unidad (PINU, Innovation and Unity Party), Leitzelar represents a small party that’s never held more than five seats in the unicameral, 128-member Congreso Nacional (National Congress). PINU was founded in 1970, after the destabilizing ‘Fútbol’ War with El Salvador in 1969, as an alternative to the two main political parties at the time — the conservative Partido Nacional (National Party) and the more centrist Partido Liberal (PL, Liberal Party). ‘We have always been a party that been focused on thoughts and processes, and it hasn’t always been a party that appeals to the mass majority, but working for the mass majority, with democracy always in mind, constituting an equilibrium, a balance in Congress,’ he said. Leitzelar opposed the June 2009 coup that ousted Manuel Zelaya from power (though he’s certainly no fan Zelaya’s), and he’s been a strident critic of the president of the National Congress, Juan Orlando Hernández, the National Party’s presidential candidate. In particular, Leitzelar spoke out against a 2012 vote by the National Congress to depose four justices of the Honduran supreme court, which he believed was unconstitutional. 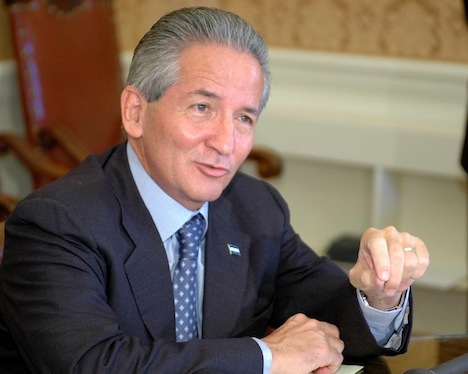 But lest you believe Leitzelar is simply a good-government ninny tossing pebbles into a political system where PINU barely causes a ripple, he’s also been at the heart of Honduran power — as minister of labor in the previous National Party administration of Ricardo Maduro (pictured below) between 2002 and 2006. Above the sofa in Leitzelar’s office is a large framed drawing of the entire cabinet in caricature, and Leitzelar believes that it represents as good a government as Honduras has ever had. Many Hondurans view Maduro’s administration as somewhat of a success, at least insofar as that it didn’t result in a military coup (like the Zelaya administration) or preside over the deterioration of Honduran security and the Honduran economy (like the current administration of Porfirio Lobo Sosa). It’s a view that Leitzelar shares, and he has as much disapproval for the first Zelaya administration as the current administration. TEGUCIGALPA — In the final moments of an hourlong interview about the situation on human rights in Honduras, Dr. Leo Valladares mentioned his upcoming trip to meet Germany’s president to discuss human rights throughout Latin America. Though it was obvious Valladares was excited about the opportunity to bring his four-decade long crusade for human rights to Berlin, his eyes sparkled when he talked about visiting his daughter, who also lives in Europe. None of Valladares’s children live in Honduras now. Not any more. He leaned in, with the same gentle tone that he’d been using for the past hour, to tell me that he, too, has lost a son. (That son, Rodrigo, was killed in a carjacking in January 2009). ‘We all know who did it,’ he said, without rancor or bitterness — and Valladares, whose particular worldview is suffused with the Jesuit social justice teachings of his high school days, publicly told the Tegucigalpa newspaper El Heraldo two years ago that he’d forgiven his son’s assassins, which is more forgiveness than most fathers would afford, no matter whether they’re in Honduras or Berlin. Like so many other Honduran families (in a country with the world’s highest homicide rate), the tragic violence that’s afflicted Honduras with ever greater intensity over the past decade has taken a horrific toll of Valladares and his family as well. Valladares served from 1988 to 1995 as a member of the Inter-American Commission on Human Rights, and he also served as the national commissioner of the Comisionado Nacional de los Derechos Humanos (CONADEH, National Commission of Human Rights). Today, he’s formed his own non-governmental organization, Asociación para una Ciudadanía Participativa (Association for Participatory Citizens) to continue the fight for human rights in Honduras. 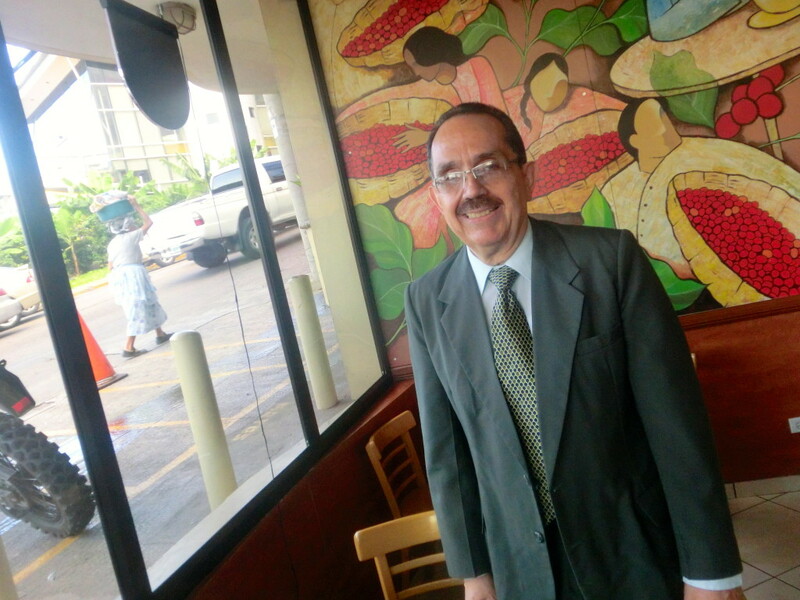 Like many of the Hondurans with whom I spoke earlier this month in Honduras, Valladares believes that respect for human rights has deteriorated since the 2009 coup that ousted former president Manuel Zelaya. Though Valladares started his career as a member of the small Partido Demócrata Cristiano de Honduras (DC, Democratic Christian Party of Honduras), he’s essentially been a political independent since he first assumed a role as a human rights official. Though he officially supports none of the candidates in Sunday’s presidential election, he worries that Juan Orlando Hernández, in particular, poses a special threat to human rights — Hernández has made clear on the campaign trail that he believes the need for a military police and a more secure Honduras is more important than protecting the human rights of Hondurans who too often fear the police more than the criminals. That is, if you can tell the two apart — the police are, in the estimation of just about everyone in Honduras, thoroughly corrupted. Valladares worries also about Xiomara Castro de Zelaya, the presidential candidate of the leftist Partido Libertad y Refundación (LIBRE, Party of Liberty and Refoundation), and whether she can truly be an independent president from her husband, the former president who was deposed in 2009. If she’s elected, Valladares also worries that the other traditional parties will join forces to block her agenda, causing gridlock. ‘The main thing is for the election to be held in a peaceful manner and for the results to be accepted,’ he said. Part of the problem is a culture of corruption that tolerates a political elite that treats winning power as an invitation for personal enrichment. ‘One of the biggest problems in Honduras is the application of ethical values. Over here being thief of public goods is not socially unacceptable,’ he said. Throughout the election, there’s no doubt that journalists and LIBRE candidates have been subject to abuses. 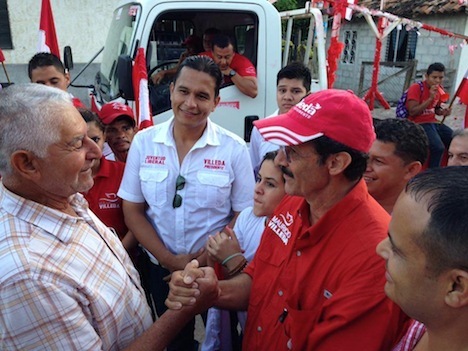 TEGUCIGALPA — In the political civil war that’s pitted conservative candidate Juan Orlando Hernández against leftist Xiomara Castro de Zelaya in a zero-sum fight for supremacy, the third candidate in the race could emerge as the moderate alternative to both. 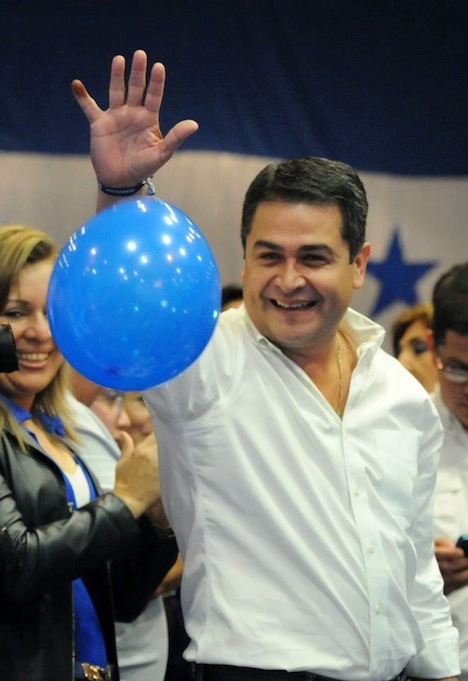 Hernández is the candidate of the one of the two longtime traditional parties in Honduras, the Partido Nacional (PN, National Party). But Villeda represents the other, more centrist party, the Partido Liberal (PL, Liberal Party). It was the party to which Manuel Zelaya belonged when he was president between 2006 and 2009, though Zelaya distanced himself from the party after even many Liberals supported the June 2009 military coup that ousted him. Ultimately, Zelaya left the Liberals to form the Partido Libertad y Refundación (LIBRE, Party of Liberty and Refoundation) in 2011, and he took much of the pro-labor, leftist wing of the Liberal Party with him. There are a lot of reasons why Villeda has stumbled so far during the campaign. He certainly has less money than the National Party and the Hernández campaign. 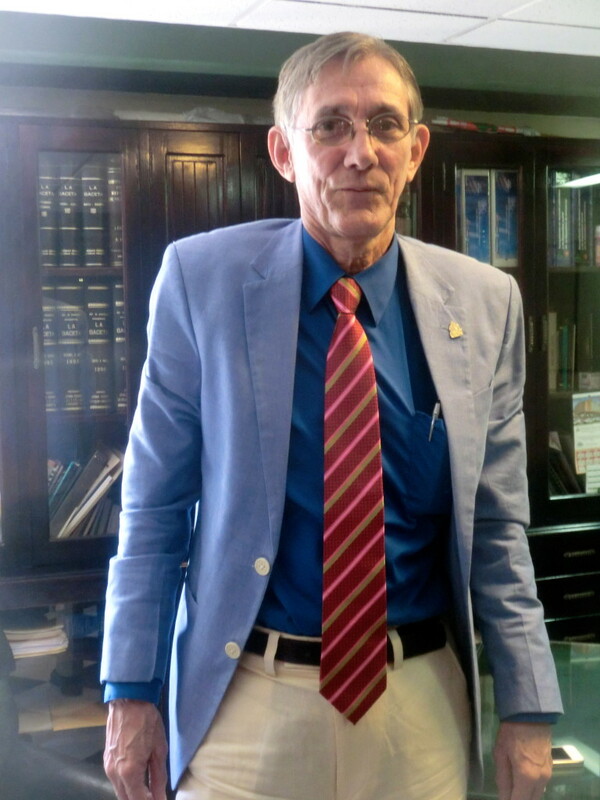 Veteran political reporter Jonathán Roussel referred to him as the ‘Michael Dukakis’ of Honduran politics, which is a somewhat generous interpretation of a candidate who lacks the charisma of either of his two main rivals and whose background as an attorney marks him as a colorless bureaucrat on the campaign trail. The latest polls, which are unreliable and now nearly a month old, show Hernández and Castro de Zelaya tied for first place with around 30% support each and Villeda far back in third place with around 20%. (Polls are prohibited in Honduras in the month prior to the election, so we won’t have any public data before Sunday’s election). I write today in The New Republic about the role that firearms play in Honduras’s security issue — the country has the world’s highest homicide rate, and nearly 80% of those homicides are committed by means of small arms, such as pistols, revolvers, shotguns, and rifles. Despite some changes to Honduran gun laws in the early and mid-2000s, however, gun laws remain relative lax in Honduras. Each person is permitted to own up to five firearms and while open and concealed carry, and the ownership of assault weapons, are both technically illegal, enforcement of gun laws is sporadic at best. Even more troubling is a corrupt police force that’s been reported to prey on some of the weakest groups in — labor activists, LGBT activists, indigenous activists and just the downright impoverished. You might expect each of Honduras’s top presidential candidates — perhaps, most especially, leftist Xiomara Castro de Zelaya — would be in support of a strong push to restrict gun ownership, but it’s just not the case — even though security is the top issue, by far, in the Honduran election. In many ways, the chances for significant gun control laws in Honduras are even more pessimistic than in the United States, where even a bipartisan push earlier this year failed to enact even mild background checks in the aftermath of the December 2012 Newtown elementary school shooting. The Honduran constitution doesn’t enshrine a “right to bear arms” like the 2nd Amendment does, but gun laws have been historically lax in Honduras. The chief restriction is a law that limits an individual to owning just five firearms, but that’s lightly enforced at best. Successive governments in the 2000s theoretically tightened Honduran gun laws—a national registry was created in 2002, assault weapons were banned in 2003, and it’s been technically illegal to carry guns (openly or concealed) in public since 2007. But in a country where officials lack the power even to investigate every murder, and where many citizens carry weapons for personal protection, those restrictions aren’t rigorously enforced. Moreover, those laws don’t apply to the police, who have been accused of perpetrating a troubling amount of the violence directed at Hondurans, especially the most vulnerable groups. But many Hondurans today believe that the U.S. is partially responsible for Honduras’s gun problem. They attribute the high rate of firearm ownership to the glut of weapons that flooded the country in the 1980s when the Reagan administration armed the Contras from within Honduras in an attempt to push the Soviet-backed Sandinistas out of power in Nicaragua to the south. Just as the United States gave its blessing to the transfer of weapons from Qatar to anti-regime Libyans in 2011 that may have subsequently found their way into the hands of Tuareg separatists (or worse) in northern Mali in 2012, U.S.-sourced firearms in the 1980s intended for the Contras have now found their way into the hands of the gangs that control the most dangerous parts of Honduras’s capital, Tegucigalpa, its industrial center of San Pedro Sula, and its Caribbean coast. 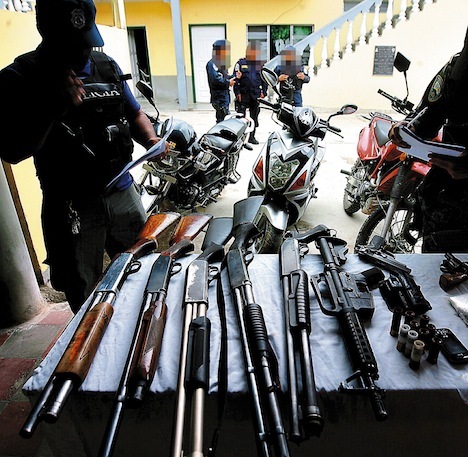 But in recent years, a swarm of illicit arms have also entered Honduras from Mexico and other parts of Central America as part of the illegal drug trade. TEGUCIGALPA — It’s been a great week here in Honduras learning some more about the choice that Hondurans face on November 24, and the contextual background of Honduran history, culture and policy — and how it intersects with US policy, both present and past. But with a lull in interviews this afternoon, I have a little time to share some photos from the campaign. 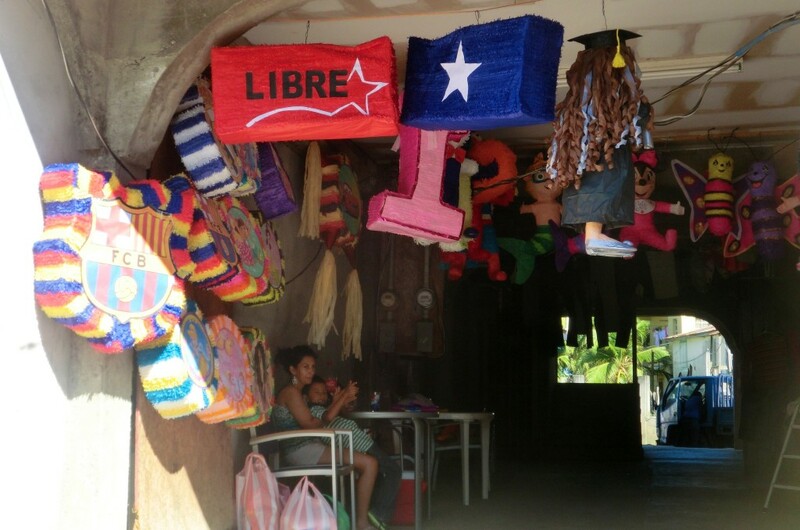 From Roatán island, the largest of the Bay Islands off the north coast of Honduras, comes this small shop, with some variety of piñatas — the two at the foreground are for the conservative Partido Nacional (PN, National Party), whose presidential candidate is Juan Orlando Hernández, the current president of the Honduran National Congress; and for the leftist Partido Libertad y Refundación (LIBRE, Liberty and Refoundation Party). which supports Xiomara Castro de Zelaya, the spouse of former president Manuel Zelaya, who was ousted from power in a June 2009 coup. 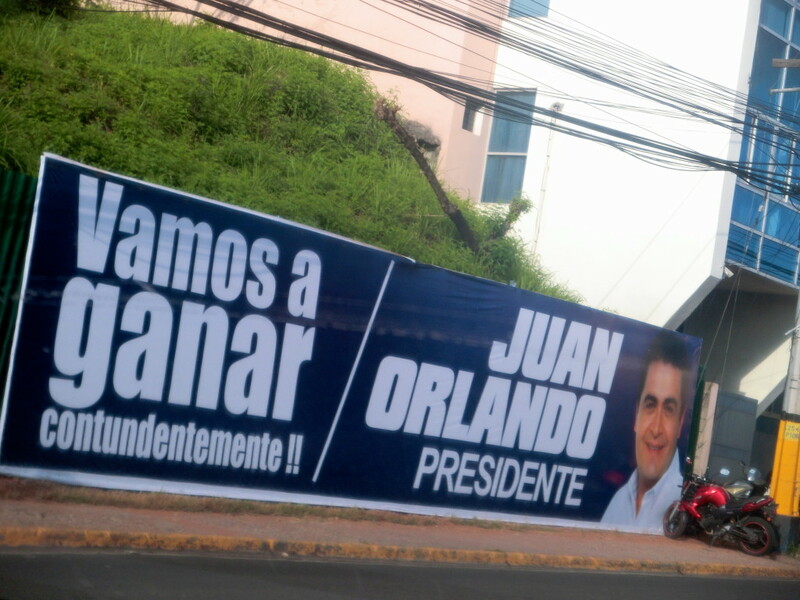 Polls show that the presidential race has turned into a dead heat between Juan Orlando and Xiomara. On Sunday afternoon, all three major parties were out in full force. Here are some young National Party activists driving through the streets of Valle de Ángeles, an old mining town just north of Tegucigalpa.